On the 19th of January 2018, Datuk Kamarul Hisham Kamaruddin delivered a speech on the occasion of Ms. Elizabeth Goh Yeek Li’s call to the Bar before his Lordship, YA Datuk Wira Kamaludin Bin Md. Said. Datuk Kamarul Hisham Kamaruddin (Elizabeth’s Mover), Mr. Goh Kee Boon, Ms. Elizabeth Goh, Mrs. Chang Pie Hoon and Mr. Amer Hamzah Arshad (Elizabeth’s Master). A reproduction of the speech delivered by Datuk Kamarul Hisham Kamaruddin can be referred to as attached below. Saya, KAMARUL HISHAM KAMARUDDIN, hadir bagi pihak Pempetisyen ELIZABETH GOH YEEK LI pada hari ini. Rakan-rakan bijaksana saya yang masing-masing mewakili Yang Berbahagia Peguam Negara Malaysia, Majlis Peguam Malaysia dan Jawatankuasa Peguam Kuala Lumpur yang telah pun diperkenalkan awal tadi. Saya ingin memohon kebenaran Yang Arif untuk meneruskan hujahan saya dalam Bahasa Inggeris. The Petitioner was born on 4th December 1993 in Kuala Lumpur and is the second child of Mr. Goh Kee Boon and Mrs. Chang Pie Hoon. 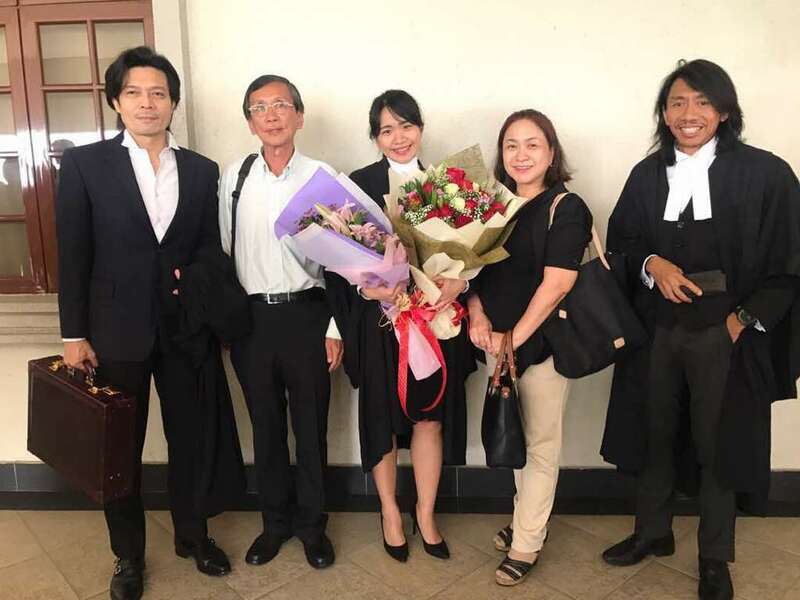 The Petitioner had her early education in SJK(C) Naam Kheung, before continuing her secondary education in Catholic High School in Petaling Jaya. Motivated by her desire to give a voice to the poor and disenfranchised, Petitioner has set her mind on becoming a lawyer since she was 16. She aspires to provide legal representation to those disadvantaged by poverty and use the law as a tool to protect the vulnerable groups in the society. The Petitioner read law at the University of Bristol where she graduated with a Second Class Honours Upper Division. During her time at university, the Petitioner was actively involved in various extracurricular activities. The Petitioner was the Vice President of the Bristol Human Rights Brigade wherein she led the team in securing sponsorship and funds for their human rights work. Using the funds raised, she and the rest of the Brigade travelled to Panama to set up legal clinic and conduct workshops for the rural communities. The Petitioner pursued her Bar studies at Nottingham Trent University where she received the grade of ‘Very Competent’. Applying what she learned in the advocacy classes, the Petitioner argued persuasively in a Mooting Competition judged by a Queen’s Counsel and emerged as the winner in the individual competition. Upon completion of her Bar studies, the Petitioner commenced her pupillage in Messrs. AmerBON, under the tutelage of Mr. Amer Hamzah. Today, the Petitioner wishes to take this opportunity to express her utmost gratitude to her family. She would like to thank her parents for their unwavering support and encouragement, without which she would not have been able to achieve any of the milestones in her life. Her parents never cease to believe in her even in the face of failure and constantly push her to achieve great heights in life. No words can express how thankful the Petitioner is to her parents for their love and sacrifices. The Petitioner would also like to thank her brother for always being her confidant and source of inspiration. The Petitioner would like to thank her pupil master, Mr. Amer Hamzah for providing her with opportunities and guidance throughout her pupillage, and for enabling her to see the great art of advocacy and persuasion that she learned in Bar school come to life. The Petitioner is grateful to Mr. Edmund Bon who has been a mentor to the Petitioner since her student days, guiding her through her studies, soul-searching phase and subsequently career decisions. The Petitioner would like to specially thank her friends Ling, Tanya, Michael, Abhilaash, Mun Yee, Leon, Beatrice and Claire for always being there for her to make the tough times more bearable. The Petitioner is also extremely grateful to Datuk Kamarul Hisham, her mover today who has kindly agreed to take time out of his very busy schedule to move her call. Finally, the Petitioner would like to thank all her colleagues at AmerBON for making her experience there a memorable one. Yang Arif, I believe that the Petitioner is a fit and proper person to be admitted and enrolled as an Advocate and Solicitor of this Honourable Court. I believe all the Petitioner’s papers are in order and that my learned friends from the Attorney General’s Chambers, the Bar Council and the Kuala Lumpur Bar Committee respectively have no objections to this motion. I humbly move this Honourable Court to admit and enrol the Petitioner, ELIZABETH GOH YEEK LI as an Advocate and Solicitor of the High Court of Malaya.